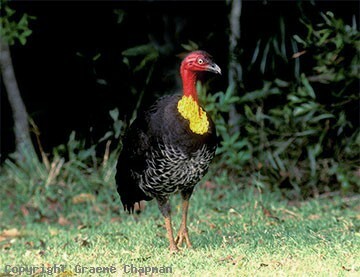 The Australian Brush-turkey is one of three species in Australia known as "mound builders", that is they all maintain a large mound of earth and rotting vegetable material in which they lay their eggs to be incubated by fermentation. 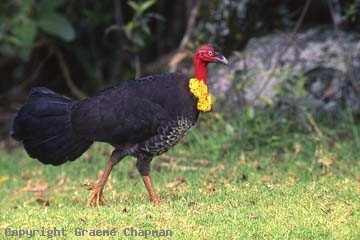 Known colloquially simply as "turkeys", Brush-turkeys occur in and around rainforests of eastern Australia, from Cape York south to the Illawarra district of NSW. Only the male constructs the mound which may reach four metres in diameter by about a meter high - in the breeding season working the mound occupies much of his day and he fiercely defends it against any rivals or sometimes even would-be predators such as goannas. Unfortunately, this habit of raking up material from a wide area has brought the birds that live near habitation into conflict with gardeners. Finding a "turkey" in your garden is bad news! 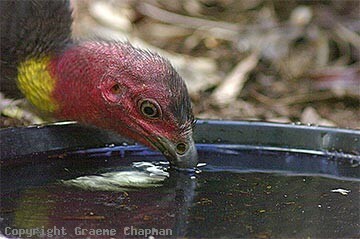 008002 ... Australian Brush-turkey, adult male. 008203-D ... Drinks by sucking. 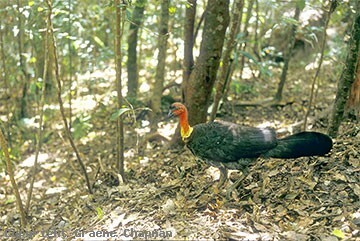 008205 ... Australian Brush-turkey working nest mound.